Traditional metal braces are so yesterday! When we think orthodontic treatment we generally think braces. That’s because braces are the primary treatment used by orthodontists. While braces have become more streamlined in their approach they aren’t the only options for straightening teeth. Orthodontic dentistry specializes in correcting misaligned jaws and crooked teeth, but the importance of straight teeth goes beyond a beautiful smile. On the most basic level having an improperly aligned jaw or teeth can make it difficult to thoroughly clean your teeth and gums. These problematic areas can put you at greater risk for tooth loss from tooth decay and periodontal disease. Before you lock down on traditional metal braces being the only way to straighten teeth, check out some of the other orthodontic treatments for straightening teeth. Ceramic Braces: Yes, these are braces, but there’s a slight variation from traditional metal braces. The difference with ceramic braces is that the brackets are made to blend in with your teeth. The ceramic brackets, and sometimes the wires, are tooth-colored or clear in order to make them appear invisible. The benefit is that they are less noticeable than metal braces, but the downside is that the ceramic brackets are more susceptible to staining if not take care of properly. Lip/ Cheek Bumpers: Lip/cheek bumpers are used for early intervention for younger children. Lips and cheeks can cause added pressure to the teeth causing the teeth to crowd creating an environment for other dental issues. A lip bumper is a wire that stretches from one molar to the other preventing your lips and cheeks from touching your teeth allowing for added space when adult teeth come in. Lingual Braces: There’s one thing that separates lingual braces from traditional metal braces and it’s location, location, location. Lingual braces are placed on the inside of your teeth instead of the outside like traditional braces. Unless you tell someone that you have lingual braces, others won’t be able to tell. The downside to these types of braces is how difficult they are to clean. Tongue Crib: A tongue crib is for people who are tongue thrusters. Because of the constant tongue thrusting, this can cause teeth misalignment. A tongue crib which is similar to a mouth guard is worn at night to help restore a proper bite. Invisalign: These aren’t traditional braces by any stretch of the imagination. Invisalign aligners straighten teeth faster without anyone noticing. With the clear aligners there is no need for metal brackets and wires, food restrictions, painful adjustments, or a lengthy process for that perfect smile With Invisalign, you can achieve that smile you’ve always wanted in half the time of traditional braces. What are you waiting for? 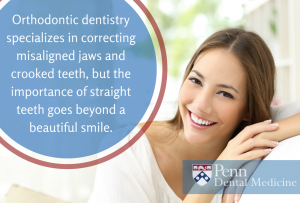 Contact Penn Dental Medicine at 215-898-8965, and discover the best option for improving your smile and your oral health.